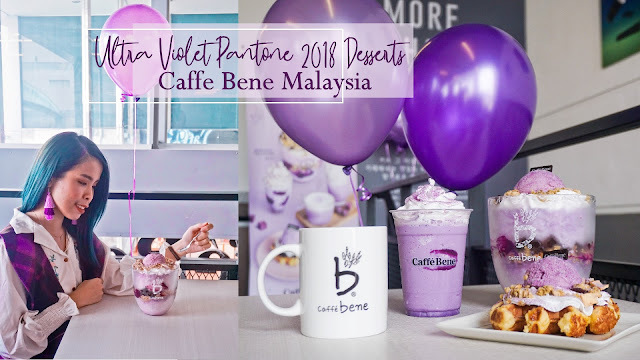 Thanks to The Butterfly Project and Caffe Bene, I had enjoyed a wonderful Ultra Violet Party last weekend with all the Butterflies. Although this is a small and cozy party together. I really love it and how we can enjoy and learn more about the concept behind this Ultra Violet Series from Caffe Bene. Since it was an UltraViolet Party, we are all in a purple and it looks so nice when seeing all of wearing my favorite Purple color in an event! A little short briefing and Q&A session with Miriam. I like how we are able to interact and ask more question how the setup and concept of this entire series of UltraViolet Sweet Potato. 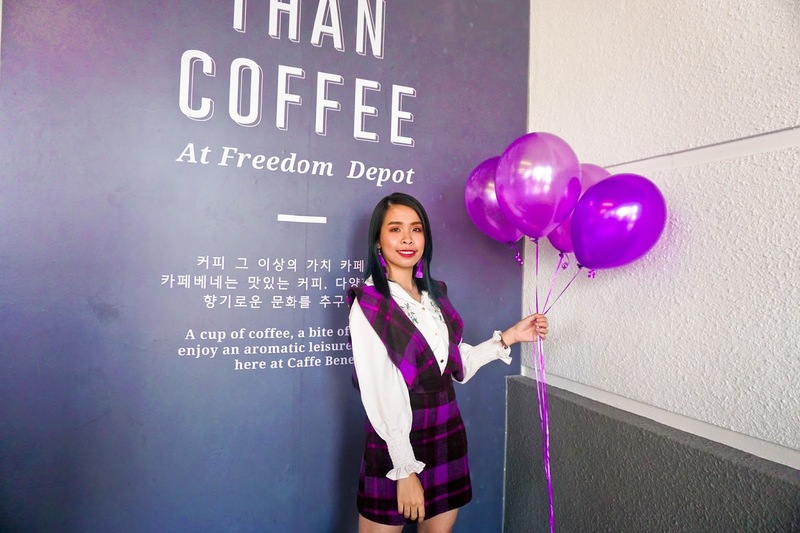 I would really excited about what's the next series coming up next from Caffe Bene. 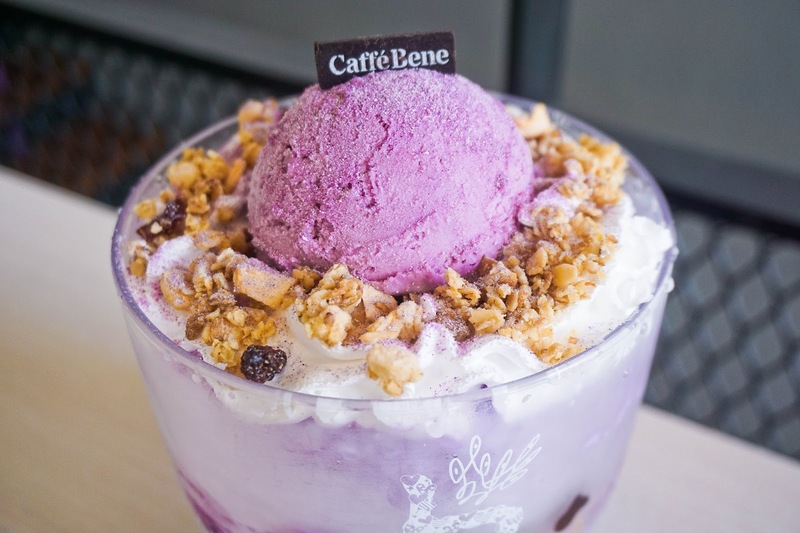 I mean Caffe Bene has been actively come out with new series of bingsu and desserts for customers. As a customer, I feel really thoughtful and surprise with their new series each time. Unlike the other branches of design, One Utama is the first branch that has the complete different interior design. All the while, the interior design of all the branches are more to the dim and cozy ambiance. When you visit One Utama branch, you can see that there are more lightning and even bar table for you to chill. They are opting for working space interior design, with bigger space, comfortable space, with more lightning and more plugs too! My look of the day! 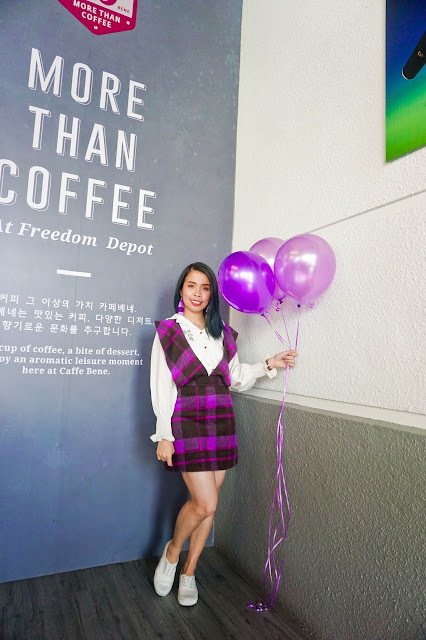 I am wearing back the same purple outer skirt again in my previous post. I just feel that this skirt looks more pretty and unique to wear to this party! Unlike the previous matching outfit, I wear with a long sleeve to makes this entire look fancier but stay on casual with my sneakers. 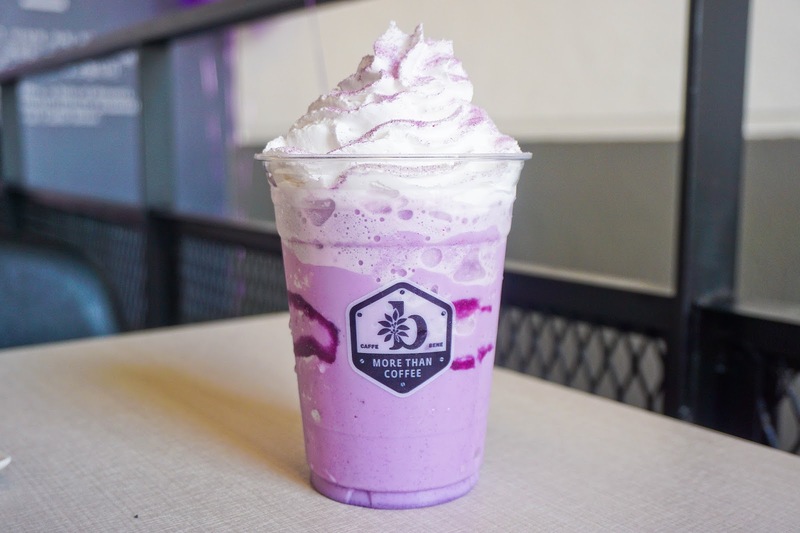 If you are a fan of cold chilling drinks, this Frappeno might be able to up your game. 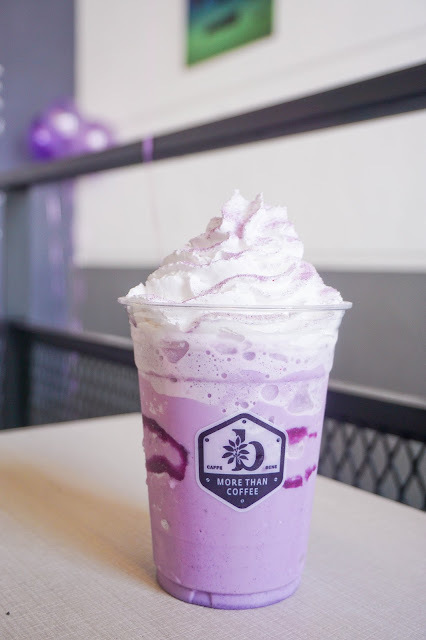 Ice blended purple sweet potato frappeno, topped with whipped cream and sprinkle with purple sweet potato powder for that finishing touch. With sweet aroma of the sweet potato when you sip it, it actually has it own unique blending and taste in it. 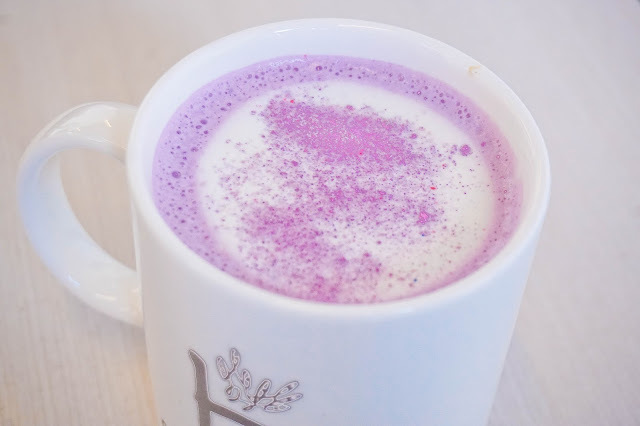 Not my favorite because I will always prefer hot drinks over cold drinks. This is definitely my kind of drink in the morning or in the noon. This is a Non-Caffeine Latte since I am not much a coffee lover this actually suites my tastebud. With smooth, creamy and the thick aroma of sweet potato while drinking, I actually in love with this drink! Drink it while is hot or it might have taste differently or to drink it with cold serving too. This is my second try on their waffle! 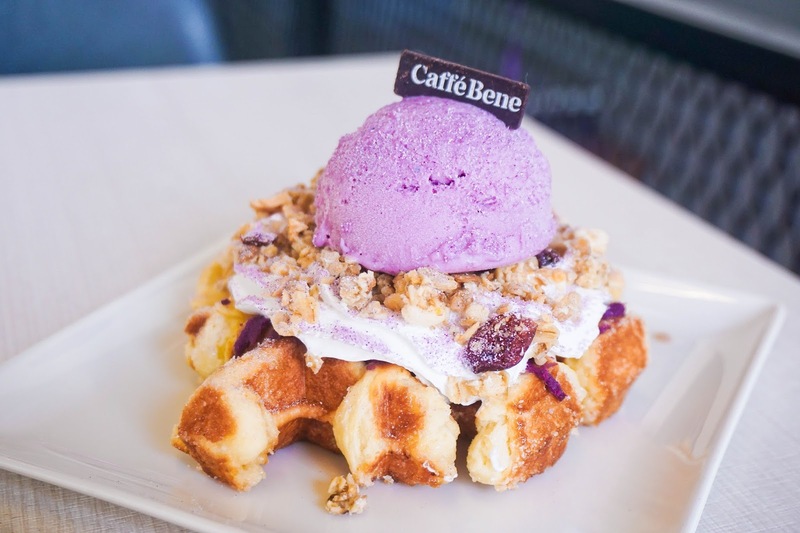 Since I don't eat much of desserts, the Caffe Bene signature Belgium waffle (Plain/Walnut) waffle topping with their homemade seasonal purple sweet potato gelato ice cream and sweet potato cream is the perfect balance of hot and cold desserts. I love love it so much and I could even finish one whole plate of this too! Their handmade gelato ice cream is not too sweet and there's sweet potato paste on the bottom of the ice cream too. I love how crispy their waffle is and also nice to eat it with the cold mixture of the ice cream too. 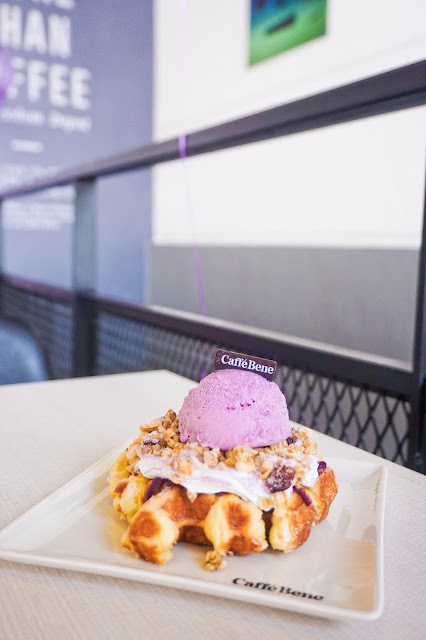 This ultraviolet icy treat built up with layers of shaved ice, purple sweet potato milk base, crunchy granola, bouncy agar jelly and topped with our seasonal Ultra Violet Sweet Potato Gelato. 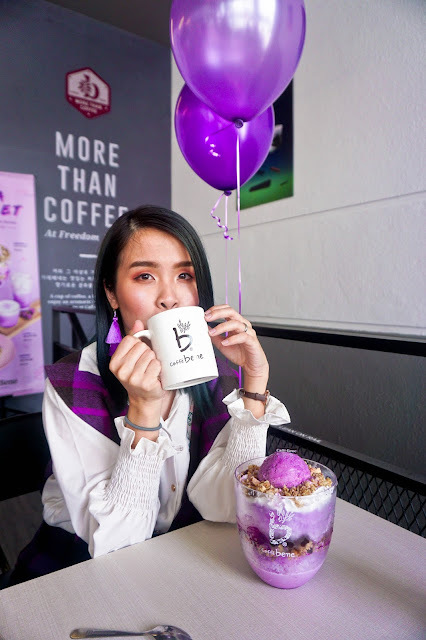 I like how each different layers of shaved ice give a different tasting experience of this Ultra Violet Sweet Potato Bingsu. 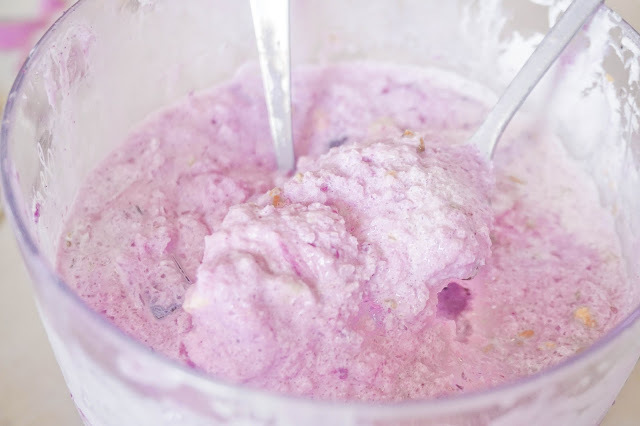 It has a crunchy, jelly, icy, sweet and milky mixture of tastebud when you taste it. 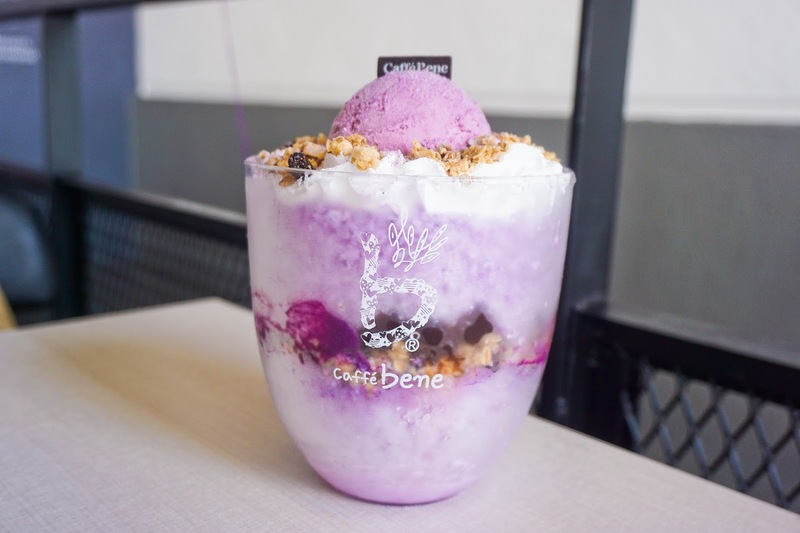 Do you know the real way of eating a Bingsu? You need to press down the ice cream on top and mix all the filling together with the ice. I never know that we have to eat bingsu in this way! It was a really fun way to eat in the "Bene Way" and especially with friends too. 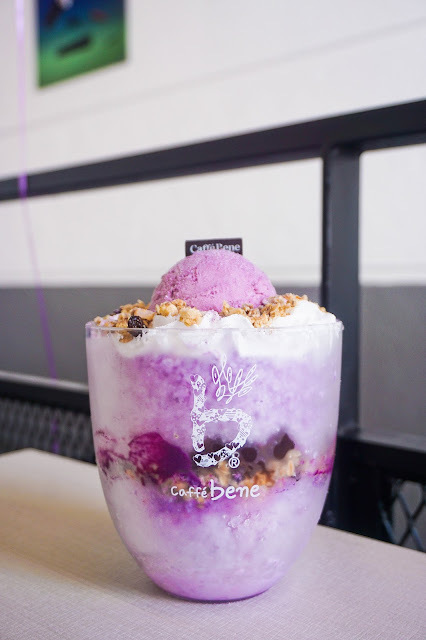 Mix all the yummy ingredients inside the bingsu, which there's raisin, sweet potato, granola filling inside. 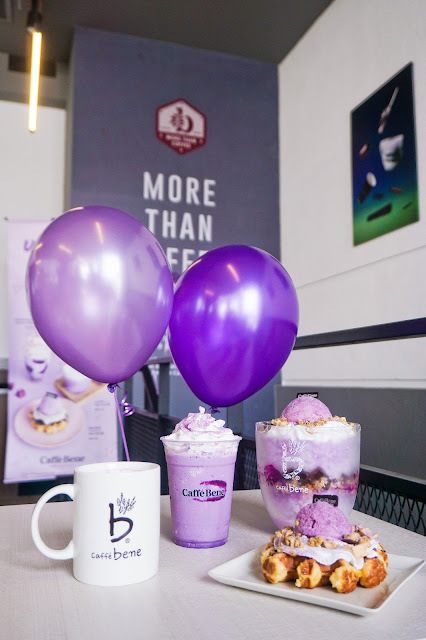 Definitely, my favorite series from Caffe Bene just because purple is my favorite color!! The color combination is so calm and sweet as well. I never knew that it can be so pretty for dessert too. In Korea, sweet potato is one of their staple food in Korea. It was a really healthy and easy type of food to prepare and to get. Since sweet potato contains a lot of health benefits, tentatively it draws out to the group of the 30s - 50s. 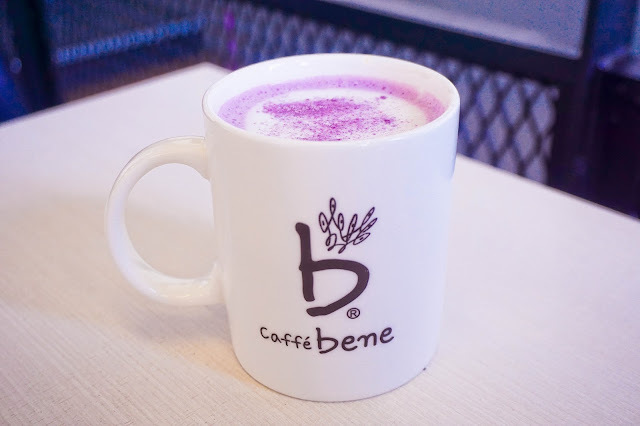 Just grab a cup of UltraViolet Sweet Potato Latte and pastry from Caffe Bene, you are good to kick-start your day ahead! This UltraViolet series will end in 15th of April!! 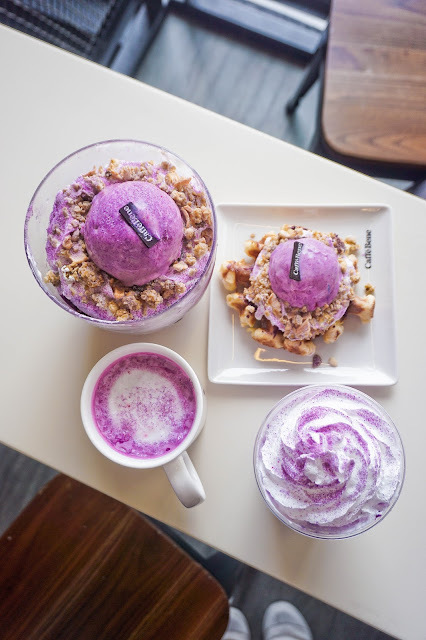 Be sure to check out any nearby outlet and try out this Ultra Violet Sweet Potato series from Caffe Bene. Be sure to take lots of photos and share your love for this series, they might release it again in the future too. Caffebene Malaysia is also working on releasing this series to East Malaysia too. So friends from East Malaysia, be sure to follow their page for latest updates! 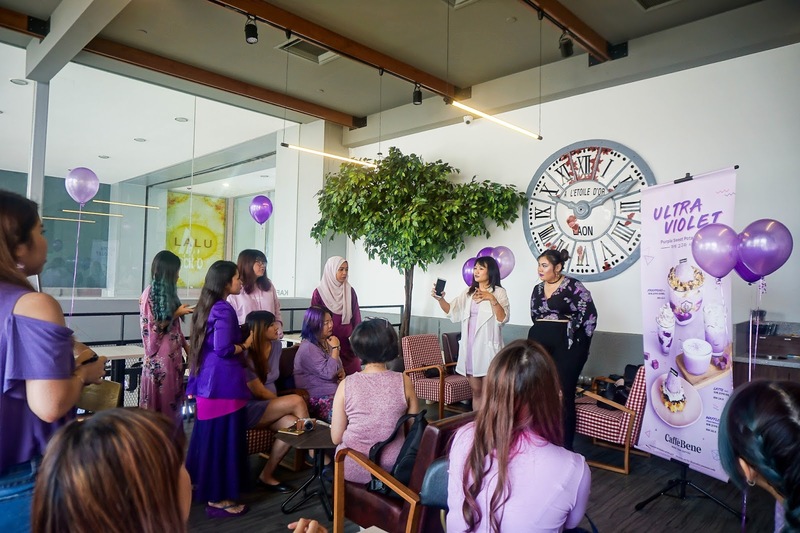 Thanks again for The Butterfly Project for this wonderful morning of the UltraViolet party with Caffe Bene! I love how our community has always aimed for reaching out and growing together as a family. We can do so much with one people, but together in a group, we can always aim to improve and non-stop learning from each other! 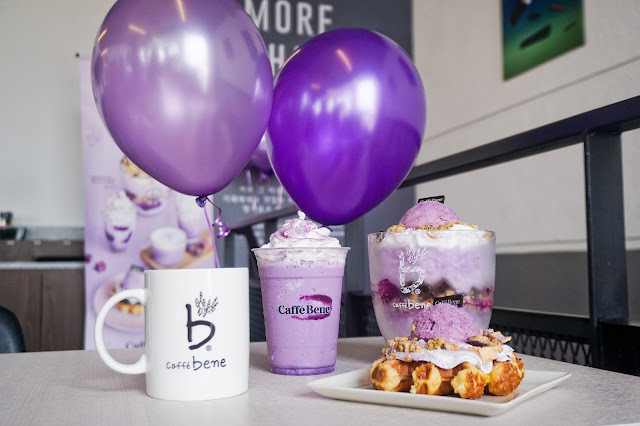 I love how it brings us all together with Caffe Bene too. 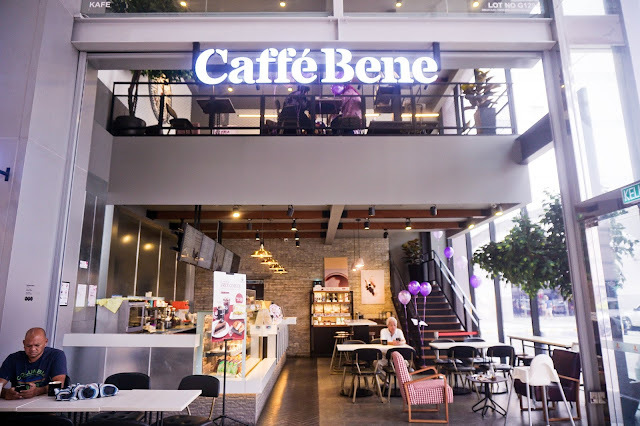 Caffebene @ Mid Valley Megamall (near GSC) NEW!! 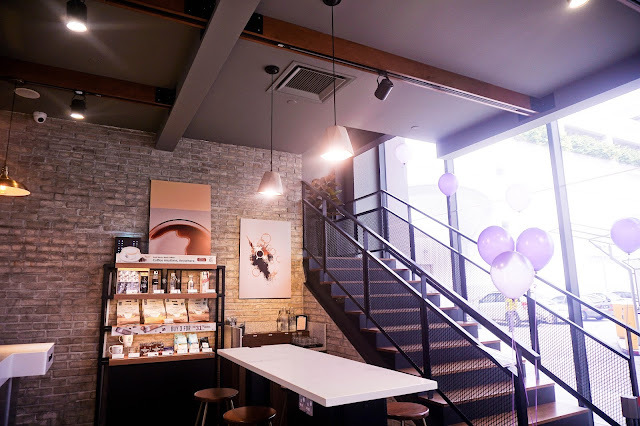 If you opt for coffee, you can also drop by at Maisondegigi where is located at Sunway Pyramid. For fruit juice lover, you can also check out Juicy Malaysia store for more fruity serving. Try out their new fun and bright fruity series with Strawberry & Friends Series and get it an XL Size with only RM15! Indeed, this outfit matches the theme of this event to a T. I love purple as well, and it is so sweet to see such rare colours in desserts and drinks. Yes! The colors is so unique for a desserts serving!! omg! so in love with this colour! And this dessert looks so good! wish i could go! huhu BTW your outfit is stunning babe! really love it! This event is so nice with everything purple. Your outfit looks beautiful. and Purple is my favorite color!! Omg so kawaii! Glad that Caffe Bene in Malaysia seems doing well. Here in the Philipines they are downsizing due to loss of profits. Everything is so purple! Love that your outfits match the theme.